Since Autumn 2004 multi-word track names can now be read in if they are surrounded by quotation marks (see Section 16.1.1, “Track data”). Note the third line, which contains a narrative entry. This entry represents one of a group of types of data called Annotation entries. These entries allow inclusion of data other than vessel locations, and can be interspersed with positional data throughout the file. 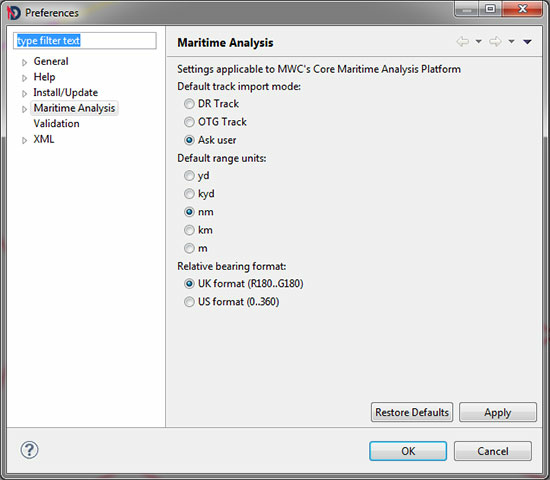 Multiple vessel tracks can be contained sequentially in a single Replay file. For more detail regarding this file format, including how to represent annotations which are only visible for a defined time period, together with lines, ellipses and rectangles, refer to the maintainers section of the this document (Part III, “Maintainer's Guide”). Note that the Replay file format just stores sensor readings - it does not store any formatting details. As a result, any formatting applied to a plot cannot be saved as a Replay file. Thus, Debrief has the Debrief File Format: This is a more complex file format that stores a wide range of data-types, formatting instructions, and user-interface settings (such as the current viewport on the data). If this is the first time of doing this, refer to the tutorial covering importing existing data into Debrief (Track). When data is imported, Debrief applies default values to the time labels for positions. The first point in a track, together with the first point every day, includes the day, otherwise just hours and minutes are displayed. We do realise that you haven't learnt how to show the labels on a track yet - that's still to follow; but remember, when you switch on the labels for a track, the default labels are set at the import stage. Once imported, it is not possible to switch between the two track modes. As such, if you need to switch modes, delete the track, re-import it, and then select the track mode required.